The Central Board of Secondary Education (CBSE) is conducting Class 12 Political Science Board Exam 2019 today. Check updates. 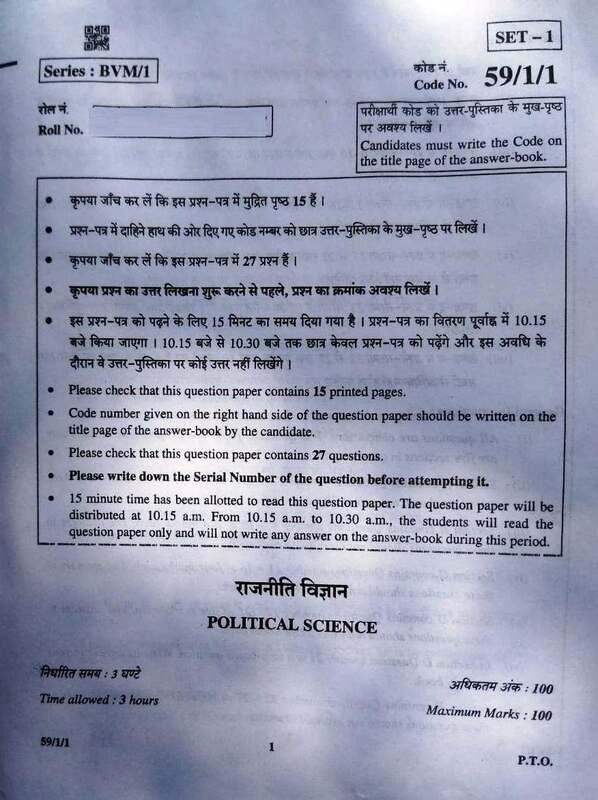 CBSE Political Science Paper 2019 was conducted on 19 April 2019 (from 10:30 AM to 01:30 PM). About 1,70,000+ students appeared for the Political Science paper today. Students who took this exam today told us that the difficulty level of the question paper was of moderate. Many students are expecting more than 70 marks. Although some students complained about the paper being lengthy. With this article, you can download complete CBSE Political Science Paper in PDF format. • Section A: Question number 1 to 5 (1 mark each) Word limit: 20 words. • Section B: Question number 6 to 10 (2 marks each). Word limit: 40 words. • Section C: Question number 11 to 16 (4 marks each). Word limit: 100 words. • Section D: Question number 17 to 21 (5 marks each). Word limit: 150 words. • Section E: Question number 22 to 27 (6 marks each). Word limit: 150 words.